Doerr, Anthony. All the Light We Cannot See. New York: Simon & Schuster, 2014. Print. Summary: A pear-shaped diamond known as the Sea of Flames has the power to bless its keeper with eternal life, while also cursing the keeper’s loved ones with misery and death. The diamond wraps together the lives of the evil man who seeks the diamond, the blind girl who longs to be rid of it, and the boy in love with her—all this with World War II raging on around them. Short, clipped sentences packed with spicy imagery and alluring enallages are the hallmarks of Doerr’s style. His semi-omniscient authorial eye cuts anywhere at any time, much like the opening and closing moments of Jean-Pierre Jeunet’s Amélie (2001), where the voice over accompanies the camera as it dashes here, there, everywhere to deliver seemingly random simultaneous occurrences. Jarring at first, the overall effect becomes hypnotic and inescapable. Each short chapter (1-2 pages) balances alternating perspectives of the evil man, the blind girl, and the genius boy, as well as several other supporting characters. 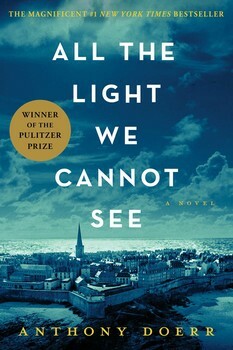 Doerr’s exploration of sightlessness is a dessert of cross-pollinated sensations. But, so too, is his portrayal of the rabid curiosity of mental brilliance, and the tranquil patience of evil. Besides the resonant language, the structure of the novel also cartwheels with the unexpected. Essentially, the book opens and punctuates its major sections with The End. Right from the start, the climax unspools before the reader’s eyes, but only a moment, at most. Then the narrative retreats four years and moves slowly forward. Then, the climax returns, advancing a few more precious moments. The tension ratchets. Then it’s back to the past, only by three years now. Over and over, this cycle loops. The effect is riveting. The reader knows what is going to happen, but not how!